So Savvy Aunties, do you have too much stuff in your life? Is it holding you back from the life you want? There’s help. In this column, I will help Savvy Aunties become better organized and improve time management skills. Let’s get started. Most of us have too much stuff. Clutter is overwhelming, and you may try to ignore it. It doesn’t always work. It’s much easier to close the door and go play on Twitter or watch TV than tackle clutter. No wonder getting organized ranks as one of the top New Year's resolutions - along with weight loss - each year. By saving time, money and your sanity, getting organized means you can see what you have, get done what you want to get done, and spend more time with those adorable nieces and nephews. So instead of buying another black cardigan, let's find the other six you already have stashed in the closet. In this economy, it’s smart to use what you have and save what you can. Before rushing out to buy all those shiny organizing products, you need to sort and purge the clutter to see what you really want to keep. I’ll warn you that making decisions about what to keep is time-consuming but helpful to getting started. • Do I love this? Does this make me happy? • Will I ever use it? • Is this important enough to take up my valuable real estate? • Can I get this somewhere else? Who else has this? Donna Smallin, author of The One-Minute Organizer, says: “Trying to organize your home in one day is like trying to eat an entire piece of cake in one bite. You’d choke. Work on organizing projects in small chunks.” I know it’s tempting to try and eat a slice of cake in one bite, but it’s better to break the clutter sorting down bite by bite, step by step, pile by pile. If you try to tackle the entire room at once, you may run screaming out the door. Let’s use the closet as an example. Instead of tackling the entire closet, sort and purge your shirts. The next day, do the skirts and then the pants. Keep going until you’ve completely sorted and purged each section of the closet. 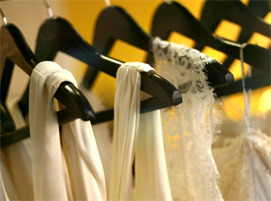 In a week or two, you can have your closet sorted and purged just by spending a little time on it each day. In your home office, start with a pile on your desk. Working on clearing your desktop little by little, and then move to the desk drawers and file cabinets, going drawer by drawer. • Store like with like. You don’t want to store drinking glasses with your baking dishes. • If you use it on a daily or weekly basis, store it close to where you use it. Items you don’t use often should be stashed further out of reach. • Use the last 15 or 30 minutes of your day to tidy up your desk or home. Put things away and prepare for the next day. • As items come into your life, make a decision about it. Decide if you need to take action on it, toss or shred it, or file it. By taking small, bite-size pieces, you can make progress and move forward in simplifying your life. And that makes for an even savvier auntie. More tips for organizing your life are coming soon. I am currently "simplifying" my clutter...I've found that if there are items (old decorations, old clothing) that you don't really feel like just giving away/throwing away but that you still want to keep for sentimental reasons, a good strategy is to take a picture of the item before discarding it. This way it doesn't take up any of your organizational space BUT you will always have a visual reminder of the object in question!! I just moved into a new apartment - these tips are great to help me reset, reorganize and reprioritize my things! Thanks for the ideas!